Ever since I began farming I have insisted and told my man-Friday Mangal: Don’t ever burn. And he has never done otherwise. While my neighbours have continued burning leaves, twigs and branches my farm has never witnessed a matchstick being struck. However, my recent readings have made me realize that most of the organic materials used in making compost do not have adequate amounts of potassium. Forcing me to rethink my strategies. Wood ash has a good amount of potash and that’s why it is recommended for incorporation into the compost. One can add ash after every layer of compost to ensure that the trace elements in the ash are incorporated into the soil. When added to compost, ash can also help neutralise acidity in the compost as it is more alkaline in nature. Ash is composed of many major and minor elements that trees need for growth. Since most of these elements are extracted from the soil and atmosphere during the tree’s growth, they are common in our environment and are also essential in the production of crops and forages. Calcium is the most abundant element in wood ash and gives ash properties similar to agricultural lime. Ash is also a good source of potassium, phosphorus, and magnesium. In terms of commercial fertilizer, average wood ash would be about 0-1-3 (N-P-K). In addition to these macro-nutrients, wood ash is a good source of many micronutrients needed in trace amounts for adequate plant growth. Wood ash contains few elements that pose environmental problems. Nitrogen fertilizers often lower the soil pH, which makes neutralizing agents such as lime or wood ash a necessity. Ash from charcoal is not beneficial as it has some chemicals that may be present in high concentrations. Our parents and grandparents lived in harmony with Nature. They consumed what was seasonal. Well they had no other option but they were unlike us. They lived healthy lives. Interestingly, they had lot of seeds, varieties of it in their diet. Which brings me to the focus of this post. My friend KS (he is from Chattisgarh) come winter that’s post-Navratri makes it a point to include sesame seeds in his daily diet. For sesame seeds keep the body warm and provide high energy needed to fight colds. Early morning before he leaves for his customary walks he takes a tea spoonful of roasted black sesame seeds along with jiggery. He has been doing it for the past two decades and has staved off cold. Sesame seeds offer a wealth of nutrients, particularly B vitamins and minerals. The seeds provide at least 10 percent DV of vitamins B1 and B6, copper, calcium, iron, manganese, magnesium, phosphorus and zinc. They also contribute at least 5 percent DV of vitamins B2 and B3, folate and potassium. Of these vitamins and minerals, sesame seeds are especially high in copper and manganese. B vitamins help your body efficiently turn food into energy, according the Linus Pauling Institute. Copper strengthens bones and blood vessels, and works to maintain healthy thyroid function. Manganese helps your body regulate blood sugar and cholesterol levels, maintain your thyroid function and absorb other nutrients. Did you know that black sesame are highest in cysteine, an amino acid responsible for breaking down environmental toxins in your body, which helps your system fight off colds and bronchial illness. Interestingly, black sesame is also offered in the holy fire of the yagnas. The world at large is becoming more dumb while our gadgets get smarter. Time we brought back traditional wisdom in regard to food and well being to our lives rather than pop B vitamin supplements every night. Last Sunday I harvested the young leaves of my Moringa trees, of which there are three at the far end of my farm, just couple of metres from the river which runs parallel to my farm. 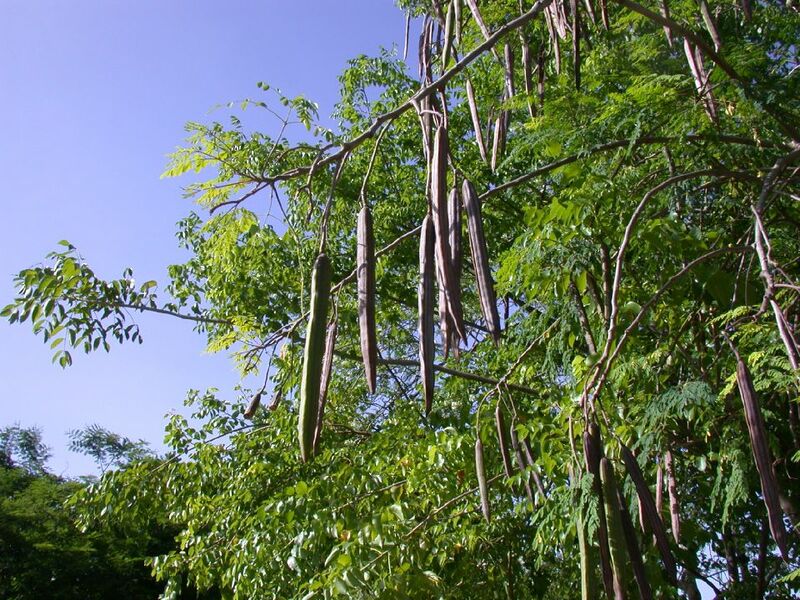 Moringa (we know them as drumstick tree) are so easy to grow I never knew that. Planted a year back they are already 10 to 12 ft tall. Moringa leaves have rich nutritional value (I had mentioned this in one of post which made me plant them ) and is known as “pharmacy in your neighbourhood.” It’s rich in protein, Calcium, Magnesium, Potassium, Iron, Vitamin A and C.
Part of the leaves I’m going to dry them in sun and rest put in dal or vegetables we cook at home. Moringa Leaf Powder Moringa leaves can be consumed fresh, cooked or dried. Since dried Moringa leaves retain their nutrient content, it is possible to convert them into leaf powder. Moringa Leaf Powder is an excellent nutritional supplement and can be added to any dish. Moringa leaves should be dried in an area protected from light to prevent the loss of vitamins and protected from dust and pests to prevent contamination. If necessary, Moringa leaves can be covered by thin cloth or mosquito netting to help keep them clean while drying. The drying process should be completed as quickly as possible to prevent the growth of molds; if leaves mold or mildew they should be thrown out or used for compost. When the Moringa leaves become brittle and crush easily, they are dry. Dried Moringa leaves can be made into powder using a mortar & pestle, local grain grinders or simply by rubbing the dried leaves against a fine screen. Once the dried Moringa leaves have been transformed into a powder, the leaves powder is sifted to remove any remaining stems. Moringa Leaf Powder should be stored in air-tight containers protected from heat, humidity and light. There is endless ways to incorporate Moringa leaf powder into the diet. Moringa leaf powder can be used as a tea, added to beverages, sprinkled on food or taken in capsules. Moringa powder can be used in cooking or salads. Moringa Leaves Powder can be added to any food or beverage and it will increase the vitamin, mineral and protein content. For healthy individuals, a few spoonfuls of Moringa Leaf Powder can be added to any meal to make it more nutritious. Since the nutrient content of Moringa Leaf Powder decreases if exposed to heat, add the powder after the food or drink has been prepared, just before serving. Can you name the world’s most useful tree? A tree whose almost every part can be used for food or has some other beneficial property. Clue: Most Indians eat the fruit of the trees. The answer: The drumstick tree. Its called Moringa (in Tamil): Murungai(in Malaylam) and Sojne (in Bangla). Its botanical name, Moringa oleifera tree. The seeds of the tree, according to Current Protocols in Microbiology, could help drastically reduce the incidence of waterborne disease in the developing world. The procedure, which uses seeds from the Moringa oleifera tree, can produce a 90.00% to 99.99% bacterial reduction in previously untreated water, and has been made free to download as part of access programs under John Wiley and Sons’ Corporate Citizenship Initiative. Michael Lea, a Current Protocols author and a researcher at Clearinghouse, a Canadian organisation dedicated to investigating and implementing low-cost water purification technologies, believes the Moringa oleifera tree could go a long way to providing a solution. Despite its live-saving potential, the technique is still not widely known, even in areas where the Moringa is routinely cultivated. Moringa tree seeds, when crushed into powder, can be used as a water-soluble extract in suspension, resulting in an effective natural clarification agent for highly turbid and untreated pathogenic surface water. As well as improving drinkability, this technique reduces water turbidity (cloudiness) making the result aesthetically as well as microbiologically more acceptable for human consumption. The immature green pods called “drumsticks” are probably the most valued and widely used part of the tree. They are commonly consumed and are generally prepared in a similar fashion to green beans and have a slight asparagus taste. The seeds are sometimes removed from more mature pods and eaten like peas or roasted like nuts. The flowers are edible when cooked, and are said to taste like mushrooms. The roots are shredded and used as a condiment in the same way as horseradish; however, it contains the alkaloid spirochin, a potentially fatal nerve-paralyzing agent, so such practices should be strongly discouraged. Leaves can be eaten fresh, cooked, or stored as dried powder for many months without refrigeration, and reportedly without loss of nutritional value. Moringa is especially promising as a food source in the tropics because the tree is in full leaf at the end of the dry season when other foods are typically scarce. A large number of reports on the nutritional qualities of Moringa now exist in both the scientific and the popular literature. It is commonly said that Moringa leaves contain more Vitamin A than carrots, more calcium than milk, more iron than spinach, more Vitamin C than oranges, and more potassium than bananas,” and that the protein quality of Moringa leaves rivals that of milk and eggs. Moringa has approximately 46 antioxidants and is one of the most powerful sources of natural anti-oxidants. Anti-oxidants supply the free atoms needed by the human body and mitigate the effect of free radicals. 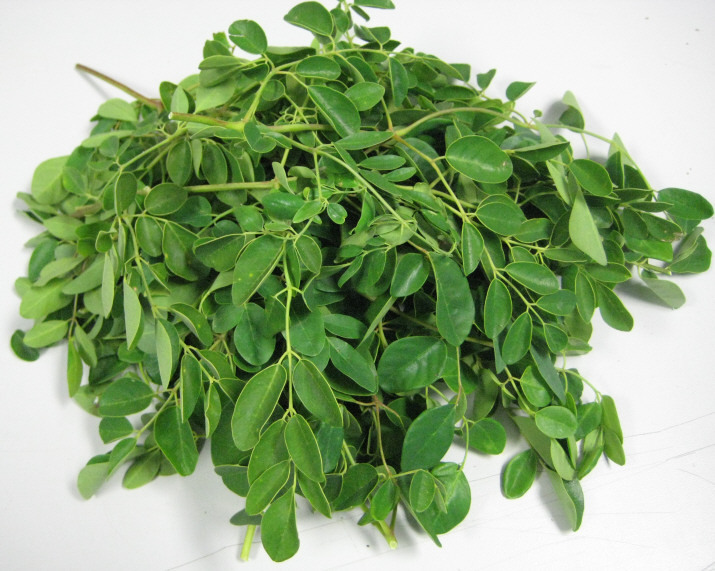 Moringa leaves are rich in Flavonoids, a class of anti-oxidants. The major anti-oxidants present are Quercetin, Kaempferol, Beta-Sitosterol, Caffeoylquinic acid and Zeatin. Antioxidants play a major role in controlling the symptoms of aging process and improve the cardiovascular health. Additionally, Vitamin C & Vitamin E, present in Moringa, also function as anti-oxidants. Researches confirm that the anti-oxidants deliver the desired result, if only taken with the combination of other essential vitamin and minerals, which makes health enthusiast to seek after Moringa. Moringa leaves and fruits are loaded with Phytonutrients. Phytonutrients are certain organic components of plants, and these components are thought to promote human health. The phytonutrients present in Moringa include, Alpha-carotene, Beta-Carotene, Beta-cryptoxanthin, Lutein, Zeaxanthin and Chlorophyll. Phytonutrients flushes toxins from the body, purifies the liver, helps to strengthen the immune system, helps in rebuilding the red blood cells and the important of all, Moringa Phytonutrients rejuvenate the body at the cellular level. Moringa leaf powder has Vitamin A (Beta Carotene), Vitamin B1 (Thiamine), Vitamin B2 (Riboflavin), Vitamin B3 (Niacin), Vitamin B6 (Pyrodixine), Vitamin B7 (Biotin), Vitamin C (Ascorbic Acid), Vitamin D (Cholecalciferol), Vitamin E (Tocopherol) and Vitamin K. The list of Minerals present in Moringa leaf powder is abundant and few of the main minerals include Calcium, Copper, Iron, Potassium, Magnesium, Manganese and Zinc. One can make tea of moringa leaf powder to derive its anti-oxidant properties or sprinkle it on salad, dal or mix it atta for chappati.